Two months ago I received a call from a good friend of mine, Evert Laubscher, to hear if I want to fish the legendary Letsibogo Dam with him. I have been aching to fish this special venue for a long time now and it didn’t take too much convincing from his side to get me on board. My dad, Bernard Venter, and Maurice Kemp joined us on the trip. Evert arranged that we stay at Phokoje Bush Lodge as he has stayed there on his previous two trips to Letsibogo and have enjoyed his stay there both times. We decided to “rough it” by choosing to camp instead of making use of the well-equipped self-catering chalets. I must say the ablutions were always clean and the hot showers after a hard day of fishing were very welcome. All four of us were very excited to go on this fishing trip. We did our homework by asking other anglers who have recently fished the dam where they have caught the fish and what tackle produced the best results. 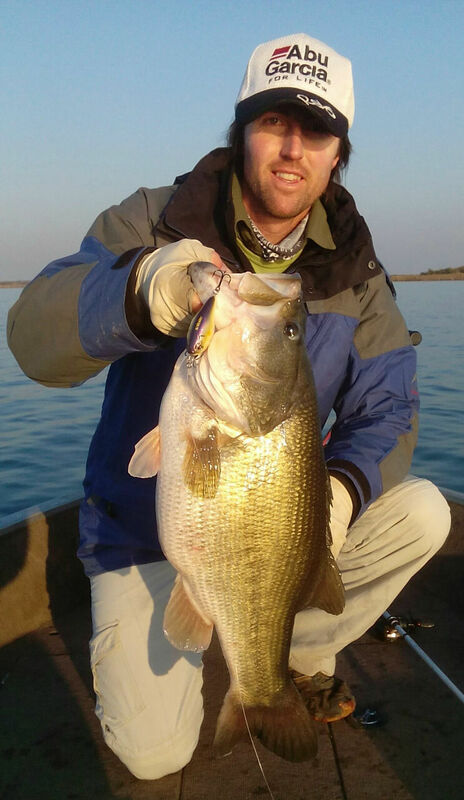 After doing a bit of research it became clear that Letsibogo Dam was home to super-sized super strong bass! 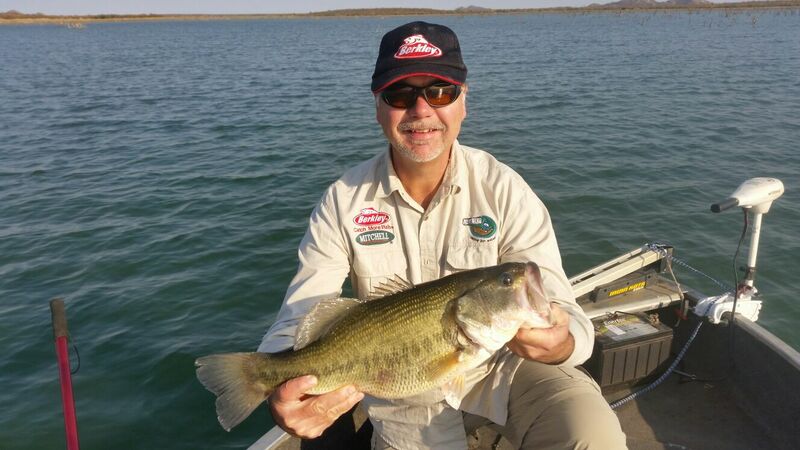 Catching 3 to 4 kilogram fish at Letsibogo is the norm while one of these size fish is a rare catch in most of our local waters. We stocked up on plenty of monster lures and huge plastic baits which are standard for fishing this venue. A few days before leaving for Letsi, I received a call from Aubrey Mardon and his son Michael asking if they can join us on the trip. 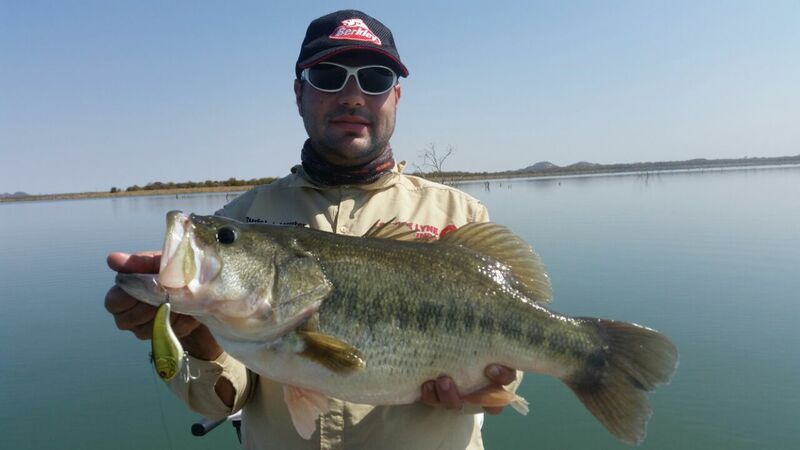 So, it worked out that we would be 6 anglers who set out to take on the beasts of Letsi. We hit the road early on the Thursday (15th July) to travel the 560km drive to Letsi from Pretoria. After a few hours on the road we arrived at Groblersbrug Border Post which we needed to pass to enter Botswana. At the Border Post the officials did not allow the Mardons to leave South Africa because they did not have the correct documentation for children. The new regulations require an Unabridged Birth Certificate for Michael as well as a letter of consent from his mother (who didn’t join us on this trip) for him. PARENTS TAKE NOTE OF THIS NEW REGULATION TO AVOID THE SAME FATE FALLING UPON YOU AND YOUR CHILREN. My dad and I arrived at Phokoje Bush Lodge a few hours later and were welcomed by friendly and helpful staff that assisted us regarding picking a good camp site, hiring a car guard and getting a boat to fish for the remainder of the day. I am very grateful towards Savvas Lambrou (lodge owner) and his helpful staff who organised a boat for my dad and I to use on the Thursday at very short notice. 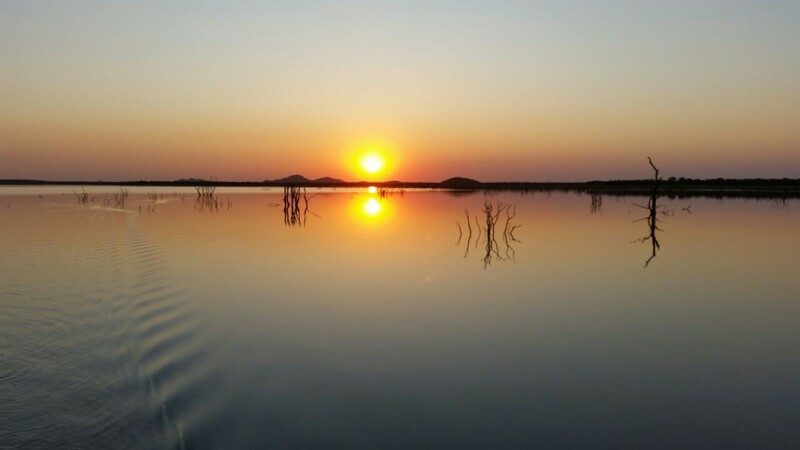 Soon enough our camp was set up and we were on our way to wet our first lines at the renowned Letsibogo Dam – excitement was running high between my dad and me! On the way to the launch we noticed that the dam’s water level was very low and that the water clarity was exceptional. 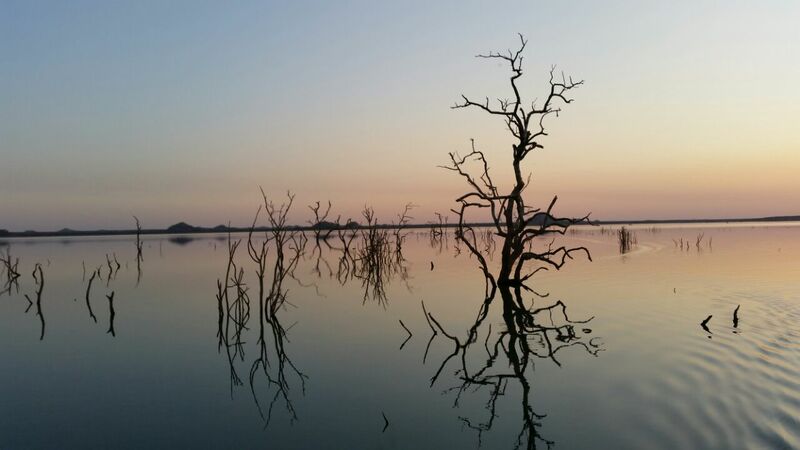 Normally Letsi has milky stained water, but because the dam has not received rain in a long time and due to the water level dropping it has enabled the dust to settle resulting in a clear dam. We also noticed that many of the trees and rocky hills that anglers used to fish were now standing on dry land. 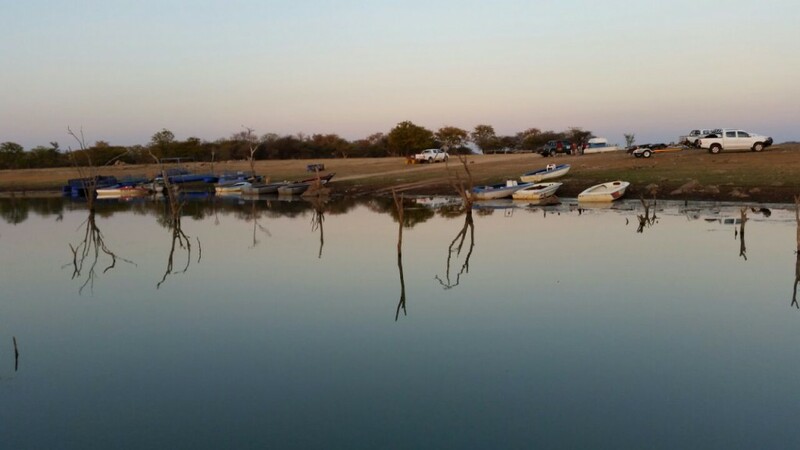 Since it is almost impossible to tow your own boat to Botswana due to their regulations, it is easier to hire a boat from the Phokoje Bush Lodge. Only trolling motors allowed to be used on this dam. Anglers can hire trolling motors and batteries from lodge or used their own. I would recommend bring at least three trolling motors with four batteries for every boat. As you can only travel by trolling motor from spot to spot, it is crucial to have enough batteries to power these trolling motors. We spend most of our first few hours on the water to explore the dam. We started by fishing the trees close to the launch. We pitched large Mcarthy paddle tails against the trees while getting use to operating the boat with no outboard. While working the trees we noticed that the shallows were alive with shoals of Nile Kurper – probably an important part of the bass’s diet! We saw a promising looking underwater island which my father took a cast at. Immediately his line went tight as the bass was swimming with his lure and with a solid strike he was on to the first catch of the trip. After a short battle we netted a 2.4kg specimen – not a bad start at all! We kept on exploring the dam, mostly focusing on the dam wall side of the dam, here my father managed to catch a few rats on jerk baits. As the sun went under we headed back to the “launch” where we made a few casts before calling it a day. I pitched the large Mcarthy plastic next to a big tree and as the plastic went down my line pulled hard. I strike, only to see that my drag was completely loose as this was my first catch on my new setup. All chaos broke out as the fish was wrapping it self in the trees while I was adjusting my drag and reeling up my slack – my blood was pumping as I thought this was my first Letsi monster! To my surprise I was rewarded with my very first catfish on a plastic EVER. I found this quite ironic as my first catch a Letsi was a small catfish (bit bigger than the paddle tail I was using) and finally I joined the long list of angler’s catching a whiskered friend on a plastic while trying for green fish. 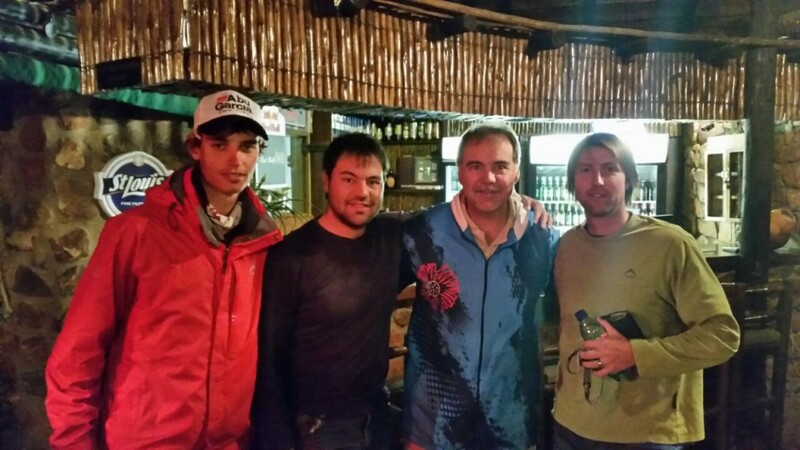 We called it a day and went back to Phokoje where we met up with Evert and Maurice who had just arrived. We discussed our first few hours at the dam over a tasty meal at the restaurant before we hit the sack. The next day we were on the water before 06:00 and this time Evert and Maurice joined us. We decided to try the river section this time. 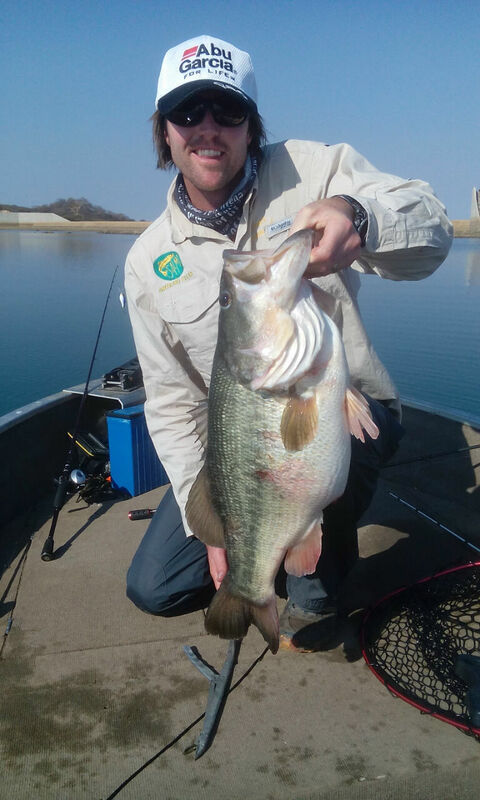 As we were following Evert towards the river we saw monster bass smash fry on the surface in the open water – immediately our hearts were pumping with adrenaline! My dad and I commenced casting our monster size spinnerbaits in the area where we saw the bass smash some fish – very strange experience as this was in the deep water in the middle of the dam! Three casts later and I was on! This was the hardest that any bass has ever hit me – almost swam away with my rod! The bass was also super strong and it gave me a good run for my money. I was stoked as we landed it, a nice 3kg specimen and my first bass for the trip! We quickly took a few snapshots and released the lunker. After this we experienced the most awesome bass session we have ever experienced. 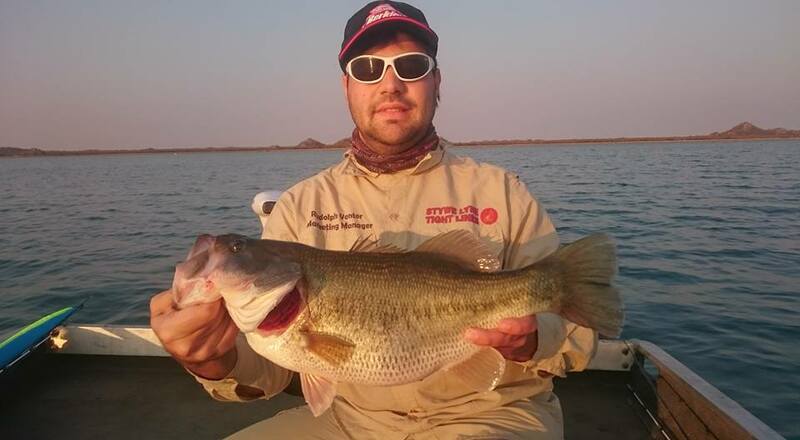 Within a few hours we managed to catch several bass all ranged between 2.8 and 3.2 kilograms! These fish hit extremely hard on the spinnerbaits and put up a legendary fight (especially compared to bass of other venues). After a while the fish went off the bite. We went into the mouth where we tied ourselves onto a tree (as the wind was pumping) and commenced fishing next to the tree line with our spinnerbaits; here we also saw a few bass hunting about.A few casts later my spinnerbait was smashed hard by a BIG fish! This was a truck of a bass! From the get go I knew I was in trouble as I made a risky cast over the tree we were attached to and this bass was heading straight towards me or should I say this tree. I first tried to pull the bass away from the structure, but I could not move it as it was just to strong. As the bass came very close to the tree I made a desperate move to avoid it wrapping me – I held my rod up and tried to maneuver it away from the tree (usually I always keep my rod down when catching bass). My move backfired as the lunker immediately broke the surface and with a heavy shake it threw my spinnerbait and to my dismay I saw my new PB disappear into the deep! (I still have nightmares about this traumatic experience) I estimate this fish to be between the 4.5 to 5 kg range. A few casts later my spinnerbait was smashed hard by a BIG fish! This was a truck of a bass! From the get go I knew I was in trouble as I made a risky cast over the tree we were attached to and this bass was heading straight towards me or should I say this tree. I first tried to pull the bass away from the structure, but I could not move it as it was just to strong. As the bass came very close to the tree I made a desperate move to avoid it wrapping me – I held my rod up and tried to maneuver it away from the tree (usually I always keep my rod down when catching bass). My move backfired as the lunker immediately broke the surface and with a heavy shake it threw my spinnerbait and to my dismay I saw my new PB disappear into the deep! (I still have nightmares about this traumatic experience) I estimate this fish to be between the 4.5 to 5 kg range. For a long time after missing this beast the fishing went quite and we didn’t get any bites on cranks, spinnerbaits or plastics pitched on the trees. I think the exceptionally clean water changed the pattern. According to the intel I gathered beforehand many anglers usually catch bass tight on the structure with big plastics – but this technique delivered no results! 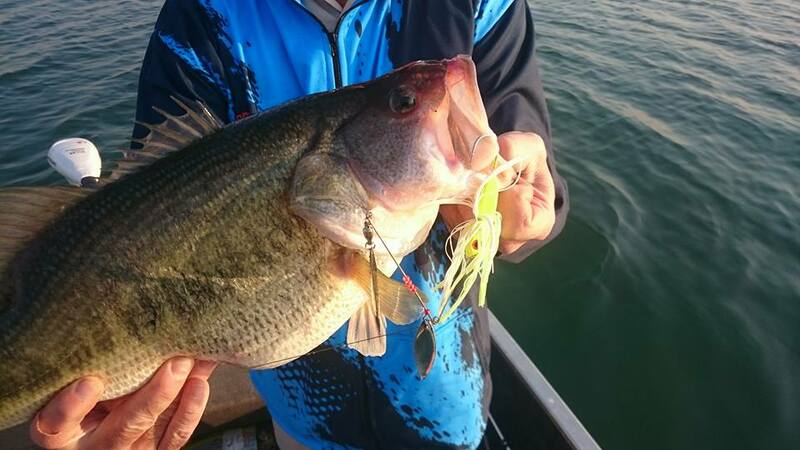 We decided to cover more water by casting cranks with the aim of finding the bass. Later that day we entered an area in the river which looked very promising, the area had clean water with lot’s of trees and a nice drop-off next to the trees. I made a few casts in the area and as I was waiting for my crank to sink my line got yanked hard! I set the hook and knew that this was a beast! The bass went straight for a submerged tree and I worried a bit that it would snap my line due to the abrasion on the branches. Luckily the Iron Silk performed very well and I managed to pull the bass out of the tree allowing my dad to net it. I was relieved seeing this fatty in the net and as we weighed it I cheered as it was my new PB of 4.06kg! It improved my previous PB of 3.2kg which remained standing for 8 years! 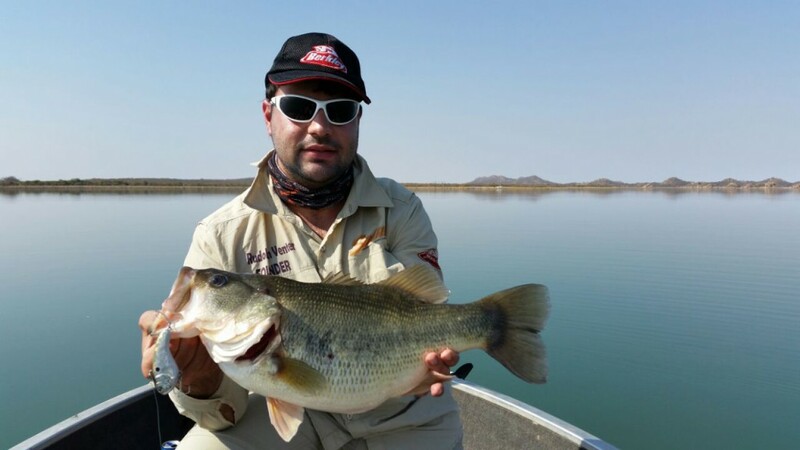 I was very satisfied as my aim was to catch a 4kg bass on this trip – mission accomplished! For the rest of the day we struggled to catch fish. Evert and Maurice also caught a few bass for the day in the 3kg range, but Evert also caught a lunker of 4.7kg on a deep-diving crank to add to their tally. On the third day we managed to figure out the pattern of the fish. The bass were forming concentrated schools as the females were staging. These schools formed in the open water and they were laying on the edge of the old river bed. We figured out that the bass were the most active during the first few hours of the morning when they would often smash baitfish on the surface. 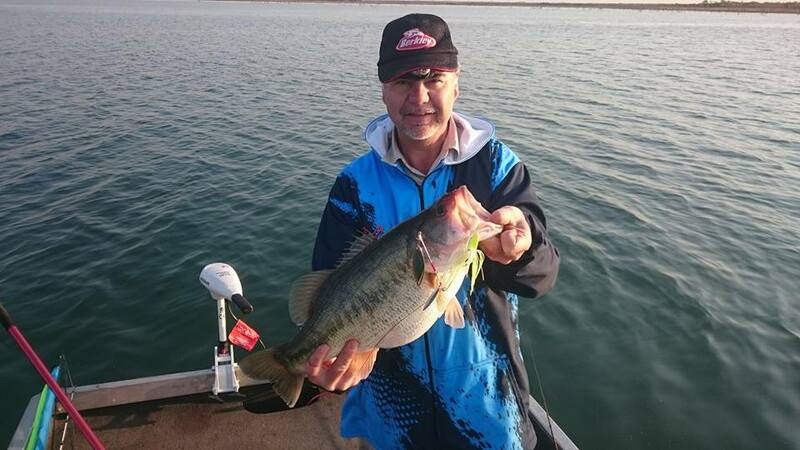 Working big deep-diving crankbaits such as Norman Lures DD 22, Sebile Crankster and Salmo Hornet as well as spinnerbaits produced the most fish. Most anglers used 20lb fluoro or mono for working the cranks and one needed to work 3 to 6 meter deep water to catch the fish. My father enjoyed catching his new personal best on his new Abu Garcia Revo MGX fitted on his Abu Garcia Villain Medium heavy action casting rod – it was a fat 3.3kg lunker that gave his rod a proper bending! I caught three fish all in the 3kg range, biggest being 3.5kg. 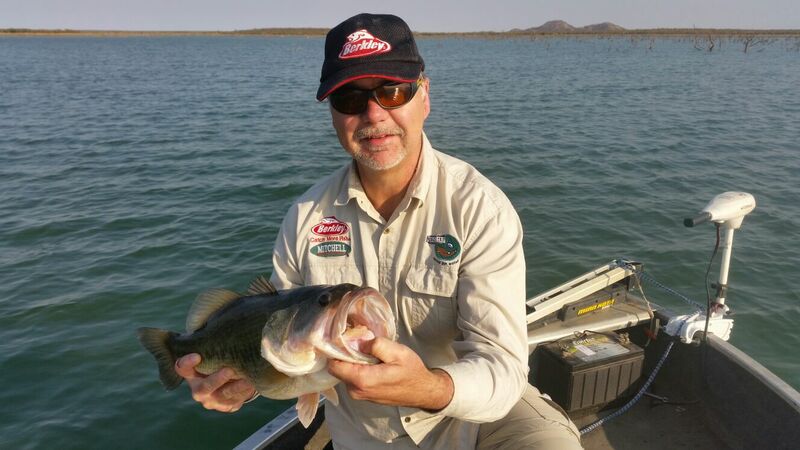 My dad caught more than me on this day with the smallest being 2.8kg – most of them coming out on spinnerbait. 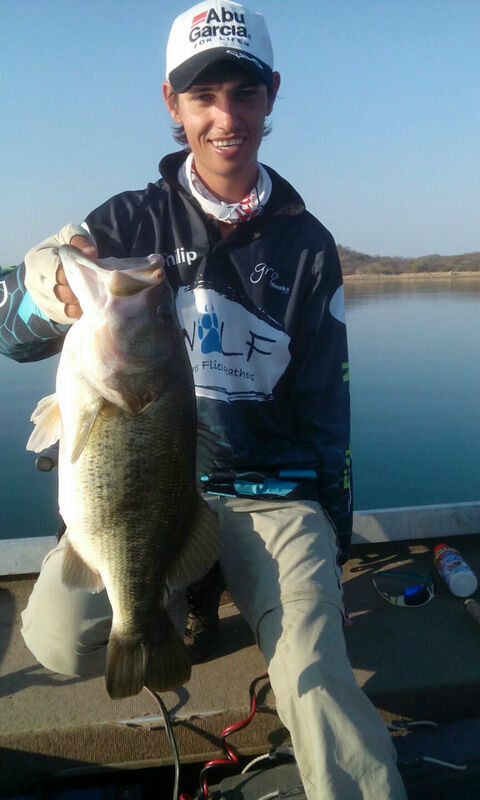 Evert had a whopper of a day catching his new PB and a monster at that of 5.82kg! At the end of the day all four of us managed to catch several bass with an average being 3 kilograms. Three of us caught new personal bests; my dad caught a 3.3kg bass, I caught the 4.06kg bass and Evert caught a 3.7kg, two 4.7kg and a monster of 5.72kg and he also caught a 4.7kg and 3.9kg on this day! 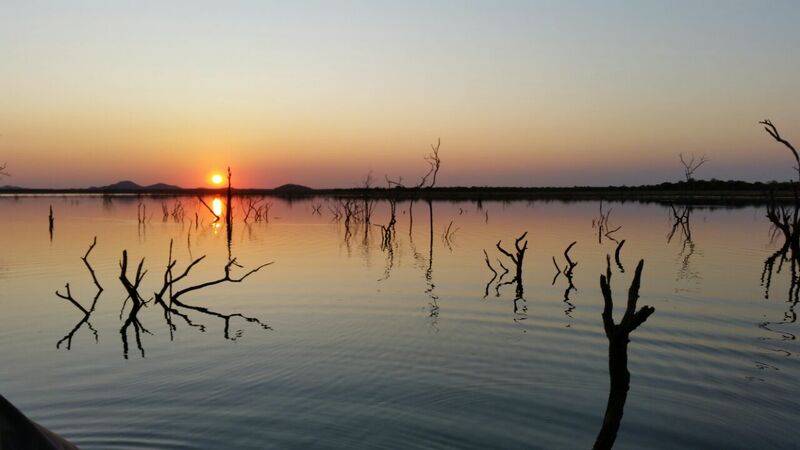 All and all, I can’t wait to fish at Letsibogo again and will book my next stay at Phokoje Bush Lodge soon! 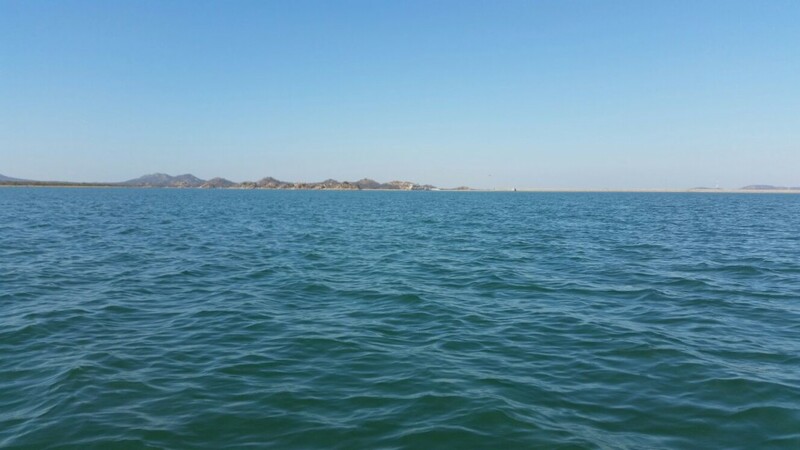 This venue is a must visit for any angler that enjoys bass fishing and it is probably the only venue where 5 kilogram fish are caught on a regular basis! ← Your winter alternative – the cat’s out of the bag! Lovely fish and good read, thanks. 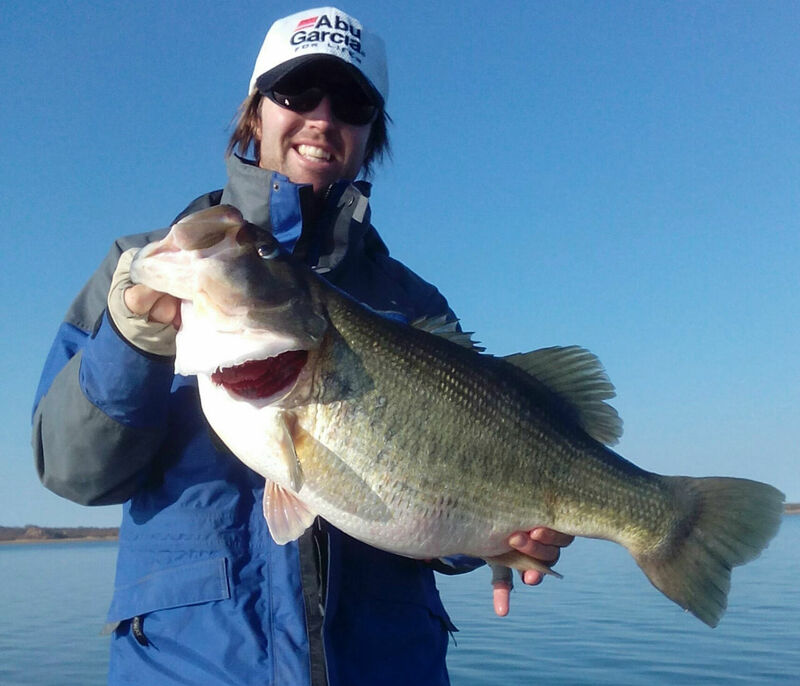 Great to see such nice big bass. Ons is n groep wat wil kom visvang en soek slaap plek en boot om te huur. We are going to Letsibogo in August, what tackle can we use for the trip? There is a group of buddies that want to plan a trip and of course letsibogo is one of my dream destinations . Could someone contact me so i can start my dream fishing trip?? Its been on my bucket list for some time now and i think its finally time myself & 3 other friends start a fishing trip of a lifetime. 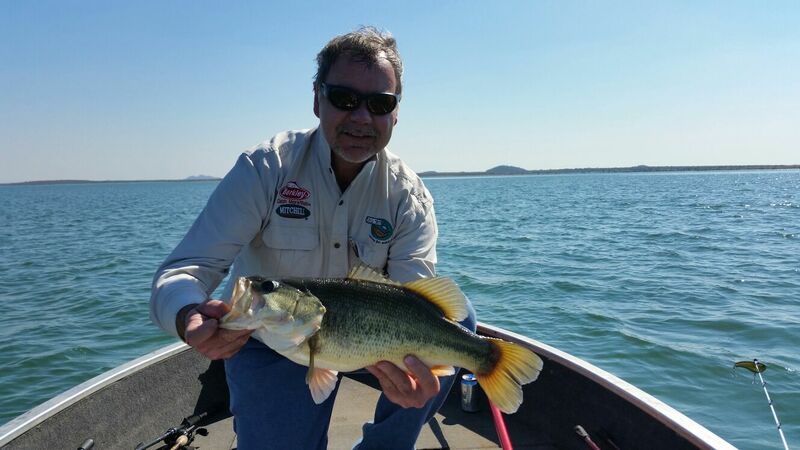 Im looking to organize a trip, when it is the best time at Letsibogo Dam for bass fishing ( is october a good month??) as i want to catch a PB and just want this trip to be a life long memory. Do you guys provide such accommodation and a guide to make sure we will get our MONSTER BASS??????? we are very serious about this trip and want everything organized and nothing left to chance. I really hope that we could something sorted out soon.